If you do decide to drag yourself away from your private pool and venture out from your villa, the French Riviera has so beautiful towns and villages for you to discover. Explore the narrow alleyways and boutique shops of Saint Paul de Vence, or why not take a trip to Cannes and enjoy fresh seafood whilst admiring the beautiful sea views? You will be spoilt for choice when deciding how to plan your days! Saint Paul de Vence Known as one of the most beautiful villages in the French Riviera, Saint-Paul de Vence has a picturesque hillside location overlooking the surrounding countryside and Mediterranean coastline. The village is steeped in history, with hidden fountains, old squares and ancient archways. Wander the charming cobbled streets lined with art studios and boutiques, or stop at one of the many restaurants to enjoy lunch on the terrace whilst admiring the views. Art lovers should visit the Fondation Maeght, containing one of the largest 20th Century art collections in Europe. La Chapelle du Rosaire, also located in nearby Vence Town, was designed by Henri Matisse and is well worth a visit if not just to see the beautiful stained glass. Cannes Located on the French Riviera coastline, Cannes is famed for its annual international Film Festival held in May. The glitz and glamour is present throughout the town, with its array of designer bars, couture shops and luxury yachts. La Croissette, a leafy, pedestrianised promenade running nearly 2 miles between the beaches and coastal road, is home to various upmarket hotels and high class boutiques. 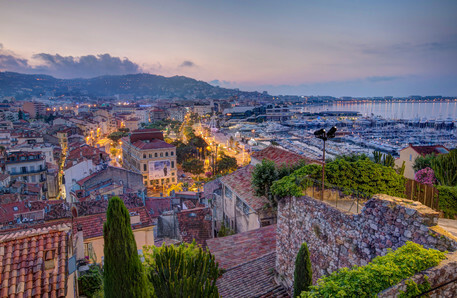 Behind all this, Cannes still has plenty of historical charm, including Le Suquet - the old quarter - with the ruins of the 12th century castle located on the hilltop. The castle is now home to the Castre Museum, showing a collection of paintings and musical instruments and boasting fantastic views over the coastline from the top of the medieval tower. You will also find a wonderful stretch of sandy coastline, ranging from relaxed beaches with limited facilities, to the exclusive beach clubs, each with their own restaurant, perfect for celebrity spotting! Antibes Between Cannes and Nice lies the stunning seaside town of Antibes, where you will find a wonderful mix of history and culture. Once home to Pablo Picasso, the Musee Picasso is well worth a visit, situated in the impressive Chateau Grimaldi. The old town is a jumble of cobbled streets and narrow passageways, lined with boutiques and charming bistros serving up classic Mediterranean fare. There is also a daily Provençal market, where you will find a wide range of local produce and a few souvenirs. There is a small sheltered beach close to the old town and harbour, and a larger stretch of golden sand to the west of the town. Nice Nice, the capital of the French Riviera, is a bustling coastal city overlooking the Mediterranean Sea. As well as a buzzing nightlife, there is a plethora of restaurants and bars, plus several upmarket boutiques and shopping malls. The daily market is worth a visit, with a range of stalls selling everything from soaps and flowers to local produce. Culture enthusiasts will appreciate the historic quarters in the Old City and can explore one of the many museums including the Musée Matisse and Musée d’Art Moderne. The long seafront, back by the renowned Promenade des Anglais, is mainly pebbly, but popular with both locals and visitors alike. St Tropez Often referred to as the playground for the rich and the famous, St. Tropez’s glamourous reputation will not disappoint. Head to the marina to admire the superyachts and enjoy a glass of wine in one of the cafés overlooking the water. Or, have fun celebrity spotting among the designer boutiques and stylish beach clubs. Take a step back from the glitzy surface and you will soon discover St. Tropez is steeped in history, from the 17th-century La Citadel offering stunning sea views, to the cobbled lanes and charming cottages of a Provençal village. Visit on a Tuesday or Saturday to explore the market on the Place des Lices selling local produce, souvenirs and clothing. Grasse Set in the hills above Cannes, Grasse Town makes for a wonderful day trip. Famous for its perfume industry, the International Perfume Museum is well worth a visit, and the local manufacturers all offer free guided tours of their factories. The Old Town is a jumbled maze ofnarrow lanes, and you can easily while away an afternoon browsing in the small boutiques and admiring the scenic views of the surrounding countryside. The main square, Place aux Aires, offers a couple of restaurants with open-air dining, great for a tasty lunch. Gourdon Gourdon, known as one of the most beautiful villages in France, has a spectacular setting on a rocky outcrop with stunning views over the Riviera. The main draw for visitors is often the wonderful views, but don’t miss the Chateau de Gourdon, steeped in history with beautifully landscaped gardens. Gourdon is a small village, but you will find an assortment of little craft shops selling locally made soaps, honey and glassware, plus several restaurants and cafés. Saint Raphael Located on the coast, the sailing resort of Saint Raphael offers a fantastic day trip. There are 5 different ports where you can admire the boats, as well as a number of beaches and little coves for you to explore. At almost 7 miles long, the Esterel coastal path is another great place to take in the scenery. Biot Perched on a hilltop, Biot is a picturesque village a short drive from Antibes. Having kept much of its original charm, you can still see the medieval gateways and rampart-houses. Originally famed for the rich clays in the area, there are a number of art and pottery galleries lining the streets and in the main square, Place des Arcades. Don’t miss the Musee National Fernand Leger, where you can see his paintings, tapestries, mosaics and ceramics. Biot is renowned for its glass works, and you can watch the glass-blowing process at the Verrerie de Biot La on the outskirts of the village, where you can also pick up a few souvenirs.